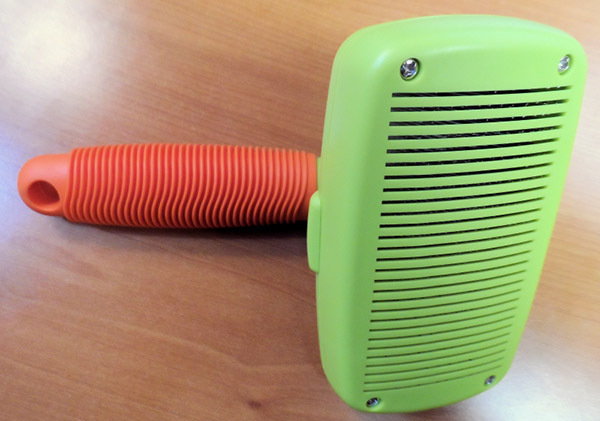 Plexidor Pet Doors: Clever brush! 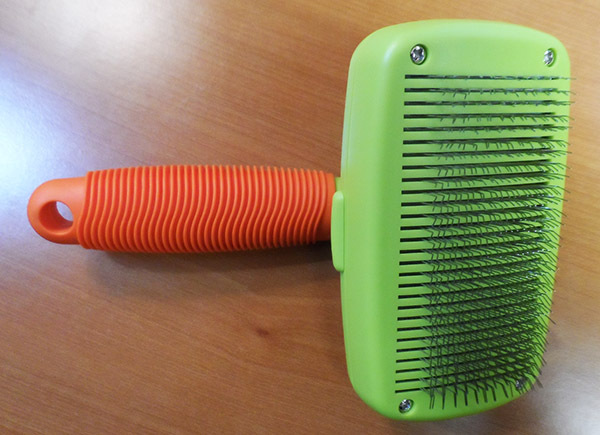 Global Pet Expo held many clever products, and the self cleaning retractable bristle brush was definitely one of them. A press of a button and the brush is smooth. Another press, and it has a large number of stainless steel bristles. The brush comes from Rinse Ace and is easy to clean and store. I've been trying it on our American Eskimo - a dog with extreme amounts of hair - and it seems to work well. I like that the brush can be stored without getting entangled in everything else; I've even had brushes ruin other things in the same drawer and that's not likely to happen with this one. I also like that the hair comes off without putting up a fight. A word of caution: many bristle brushes are very sharp, and this one is not an exception. My dog barely even notices the brush, but a pet with a thinner coat would probably appreciate a light touch. Besides brushes, Rinse Ace also has a number of cool pet bathing products, like quick-connect sprayers for a standard shower head, shampoo mitts, bathing mats, and a pet hair-snare for easier cleanup. From all the things I saw at Global Pet, this brush is one of the products that will stay with me the longest. Those types of brushes are pretty cool and make it easy to get all the fur out of the brush!